Meijer: Get Two Bottles of Kraft Dressing and Produce For $2.48 or Less! This week Meijer has Kraft Dressing on sale for $1.99 each. 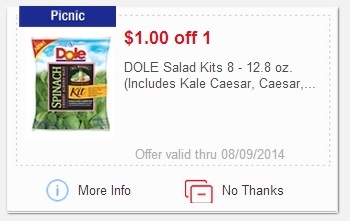 There is also a promotion to get $2-off produce instantly when you buy two bottles of Kraft Dressing. *Note: there are mperk coupons over here. Check the produce tab. This will give you additional savings on top of the promotion. There is a 50-cent Driscoll’s coupon here to use on Driscoll’s brand fruit products.